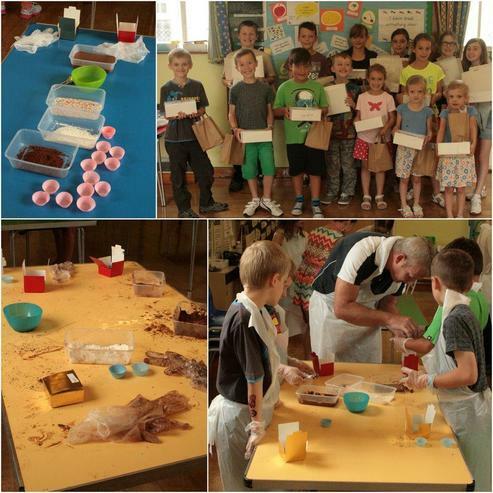 For the third year running we have had a summer cookery club where we decorated cakes, made Italian food and got rather messy with chocolate. 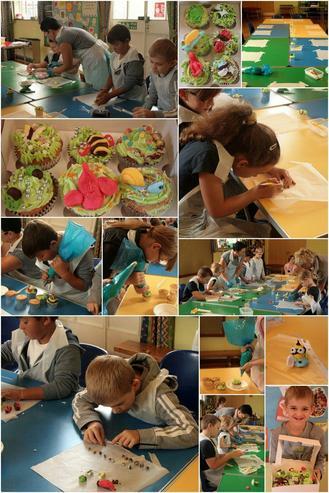 The theme for today’s cookery club was cupcake decorating. Last year’s theme was "Olympics" so this year was a garden theme with bugs and birds. For the first half of the session I demoed six different sugarpaste modelling techniques they then all had a go at making their own. While I gave the kids limited sugarpaste tools all of what they made could be made at home with a simple cocktail stick. After a quick juice & fruit break it was time to play with the buttercream. I showed them four different ways of covering and piping buttercream and I have to say they did a marvellous job. Once all the cakes were decorated and boxed the pupils then had the opportunity to try making anything their heart desired out of the sugarpaste. We had hearts, Minions and a rather amazing rose. Some of the pupils are pros at bread making as they have made it in the past, some however were new to the kneading game. All managed to make beautiful dough that Paul Hollywood would be proud of. While the children were kneading their dough I set up a glass with yeast, warm water and sugar to show that yeast is a microorganism and how it makes your bread rise. While the calzone dough was rising we made the ravioli. I pre made both the pasta dough and sweet potato & Wensleydale filling. 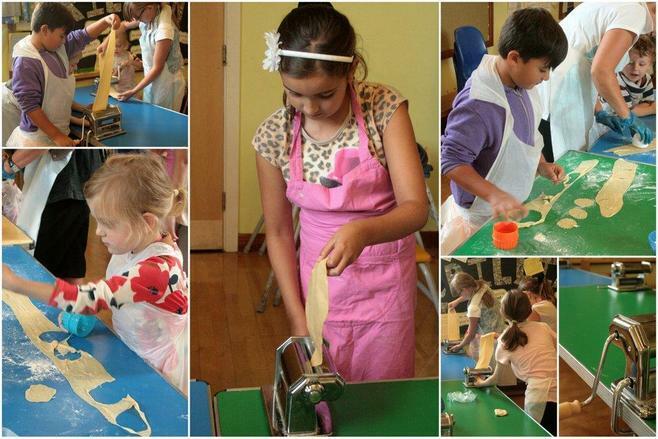 The children worked in pairs at one of the pasta machines to gently roll their pasta then assemble their ravioli. While the calzone were baking in the oven it was time for the final recipe – ice cream. Now of course there are some limitations as to what you can make in a 2.5 hour class. Usually ice cream would be out of the question however there are two cheat ways you can make it. Use the freezer bag, ice, milk & shake method, which we’ve used previous years, or use the cheats way to banana ice cream: chop a banana, freeze then pop in a blender with a couple of heaped tablespoons of lovely thick vanilla yoghurt and voila you haveinstant banana ice cream. This is not only a quick way to make ice cream but healthy too with just two ingredients. After a day of cupcake decorating and another day of Italian food it was finally the hotly anticipated Mad about Chocolate day. Unsurprisingly this was the most popular day among the pupils. This day was never going to be without mess and I always state that cookery club is about learning and experiencing food, not keeping clean. We started the day by making brownies. The pupils have been asking to make these for a while. While the brownies were baking we made a start on that popular fridge cake – Rocky Road. This was an opportunity for the pupils to work in pairs to prep the ingredients, make the rocky road and also share the mixture. 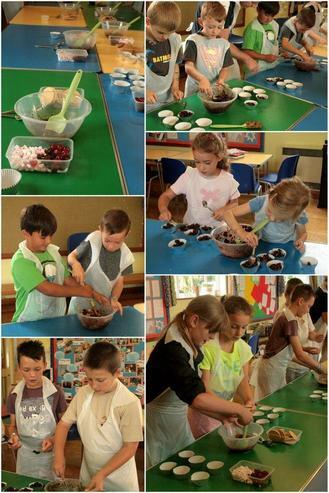 We added glace cherries, marshmallows and sultanas to the mix. After a quick break it was finally time to play with the ganache. I had made the milk chocolate ganache the night before. The children then used a metal measuring spoon dipped in hot water to heat it up, to scoop up a ball of ganache. They then had the option of 3 toppings to roll it in then had foil, petit four cases and a box to present the chocolates in. As you can see on one of the photos, the aftermath. Goes to show how much fun we had. 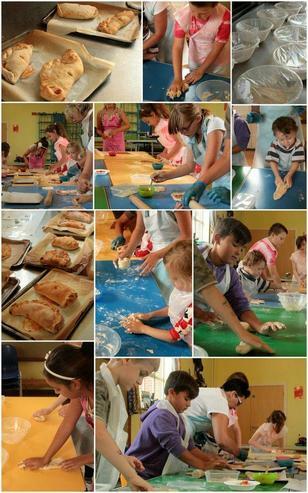 Big thanks to all who have joined and supported the Summer Cookery Club. The feedback from the pupils has been very positive. 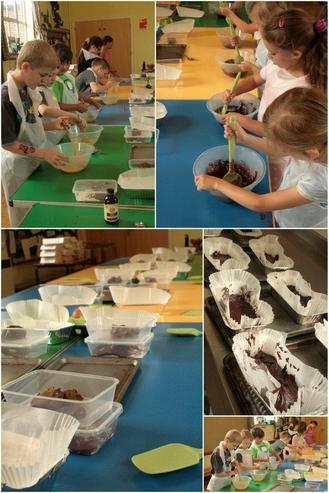 It’s clear they loved to get messy with the chocolate and really enjoyed calzone making. Hopefully Summer Cookery Club it will return for its 4th outing next year.